If your Salesforce implementation isn’t integrated with a robust contract management platform, you aren’t taking full advantage of the benefits offered by either system. 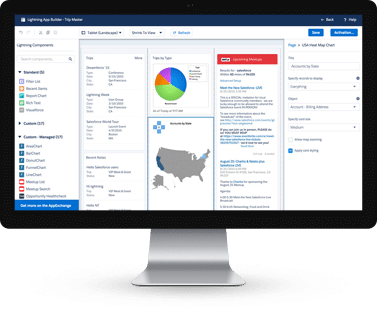 With Icertis Experience for Salesforce, your sales team can create, view, approve and collaborate on contracts within Salesforce to provide a seamless lead-to-contract process, without imposing additional administrative burdens on the sales user. Create and process self-service contracts from within accounts, opportunities or quote screens. Make use of structured forms to speed contract creation. Enable contract management functionality across a variety of use cases. Stay up-to-date with chatter notifications on contract milestones. Leverage a rules-driven engine to govern contract authoring, workflow and approvals. Get real time visibility into contract milestones without leaving the Salesforce application. Reduce lead to contracting cycle time by more than 60%. Leverage a familiar interface to improve the salesperson’s adoption of a standardized contract process. Enforce downstream compliance and reporting by capturing commercial terms in a structured form. Improve contract quality, reduce rework and improve customer satisfaction. Gain oversight over the sales and contract management work flow with proactive visibility. Leverage an intelligent rules engine to ensure compliance and mitigate risks.